You sign up, install the ViewBar, and surf the web as usual. The ViewBar will show you ads while you surf the web. You earn commission based on how long you spend your time on the web. You could convert your earnings into AGLOCO shares. You can refer your friends to use AGLOGO, and earn more. At least, that’s how they are trying to tell us. In reality, they don’t have anything to offer to their users at the moment. First, let’s analyze the AGLOGO cash flow. Unwilling to repeat their previous mistakes with AllAdvantage, AGLOCO does not use fixed rate payment scheme. With fixed rate payment, AllAdvantage was in disadvantage (no pun intended) when faced with user abuse. They ended up paying more than they are receiving and quickly exhausted their capital. AGLOCO introduces the concept of shares. From what I understand, users will earn the amount of money in proportion to the amount AGLOCO is receiving. 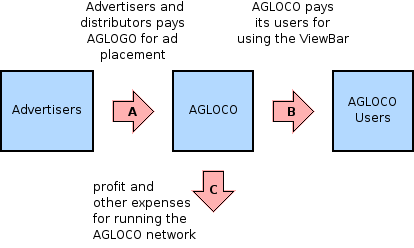 From the diagram above, A will always be greater than B, users will get a proportion from what AGLOCO get from advertisers. That would mean as long as AGLOGO has sufficient users and advertisers, it should never go bankrupt. But this would also mean AGLOCO is shifting the burden to its users. When some users are abusing the system, each legitimate user will get less than they are supposed to get. For example let’s say a user is abusing the system by creating several fake users with simulated browsing habits. Without knowing the abuse, AGLOCO will have to pay the abusive user, costing its legitimate users real money. Unlike AllAdvantage, AGLOCO doesn’t have any real incentive to combat abuse. When an abuse occurs (and it certainly will occur), users will suffer, but never AGLOCO. The only thing missing from AGLOCO as a result of abuse is the accurate number of real active users. AGLOCO needs to present this number to its potential advertiser, but it would be an easy matter for them to simply offset the approximate proportion of abuse, rather than taking serious steps in combating abuse. Assuming the same rate of income and the same amount of users, AGLOGO users, collectively, will get much less than what they would get from the late AllAdvantage. When user A joins AGLOCO, he will be rewarded 5 shares/month. When user A gets user B to join under his name, user A will be rewarded 25% of user B shares, which is 1.25 shares/month. User B will still get his full 5 shares/month. When user B refers user C, both user A and user B will be rewarded 25% of user C shares, which is 1.25 shares/month each. User C will still get 5 shares/month. This will continue until 6th level of referral. From the point of view of a user, it is obvious that in his/her best interest, he/she must get as many people as possible to join AGLOCO under his/her name. But what’s the situation from the point of view of a user who is about to join AGLOCO? By joining under another AGLOCO user, AGLOCO will need to issue 5 shares for him, and an additional up to 6*1.25=7.5 shares for his uplines. On the other hand, by joining without following a referral link, AGLOCO will only need to issue 5 shares just for him. Ignorance. They didn’t pay enough attention to the details, or doesn’t know how to remove any trace of reference. Abuse. Puppet users joining under a real AGLOCO user. Charity. A user want to donate a part of his share to another user. Aside from charity purposes, there’s no way a well informed user would willingly join AGLOCO under another AGLOCO user. If a user has already registered under another user, I would suggest to cancel the membership, remove cookies, and then re-register again. Is AGLOCO scam or not? As AGLOCOâ„¢ grows and the company generates positive cash flow, we will be distributing the excess cash to Members and shareholders of the company. Nobody, not even AGLOCO itself, knows when that will happen, if ever. What claimed on other blogs and sites are different matter. Anybody making extravagant claims about AGLOCO being the next big thing is probably just trying to defraud unsuspecting users into joining AGLOCO under their name, and thus getting potential extra revenue at the expense of these users’ potential revenue. Some of them even tell us as far as that each AGLOCO user will make hundreds of dollars every months in average. This is obviously a false claim since AGLOCO itself has never made such claims. AGLOGO web site has the Blogs around the world page where they list several said blogs and web sites. However, again, they are very careful not to make any claim of accuracy regarding these third party sites. Please note that blog content changes frequently, therefore we do not endorse these blogs nor can we vouch for the accuracy of the information they contain. Having said that, I don’t think AGLOCO will be a worthy source of income for its users. Here’s how. Let’s suppose advertisers pays $100000 for ad placements to AGLOCO. These advertisers will certainly expect they get pretty much the same amount of value from AGLOCO users. If they don’t get a similar value to what they are spending, they will certainly bring their business elsewhere. These values could be in the form of marketing leads or simply brand recognition. Somehow I doubt that handing people pennies to get them remember and buy their product is a viable marketing model. And let’s not forget that users will only get a fraction from the amount paid by advertisers. Of course there’s a possibility that a few of these users will get a substantial amount of revenue. In the future, they will post photos of their ‘hard earned’ checks and claim this as a proof that “It works! AGLOCO really works!” Then people with their collective Valence effect will flock and believe the proof. However, the observant among us will identify that this revenue can only come from the cut imposed on his/her numerous downlines’ revenue. Because of this, the massive spam it generates, I would suggest staying away from AGLOCO and save your time. AGLOCO Will Not Make Money Online! Ever! Kita lihat aja dulu..gimana perkembangan nya..
Oooo begitu to? Pahamlah aku sekarang, makasih sudah menulis ini mas. Sebenarnya emang Algoco itu bukan scam ya, tapi bbrp usernya menyebabkan scam? Unless youâ€™ve been living under a rock for the last few months, you should know about AGLOCO by now. Good analysis. Agloco is definitely tailor made for the intellectually incurious. The other important factor is that although many ‘top gun’ Agloco recruiters boast about their massive downline, only a few of them will actually download the toolbar. The whole thing is a farce but it will take months to fully play out. Saya memang baru dengar sekarang, karena saya selalu menghindari yang kayak beginian. Udah kenyang ditipu. Hah, paid-to-surf muncul lagi ya? Kok bisa ya? Padahal yang dulu-dulu sudah jatuh karena terlalu banyak abuse. Dulu (duluuuuu) tahun 2002 pernah mencoba ikut program paid-to-surf (lupa namanya). Sama, dulu juga diharuskan meng-install toolbar di IE yang menyita tampilan kira-kira setinggi 60px. Sambil browsing, akan muncul iklan-iklan di tempat yang dikuasai oleh toolbar tersebut. Paid-to-surf hanya bisa berjaya di jaman bubble dulu. Kalau sekarang sih jelas tidak mungkin lah. I’ll wait and see when AGLOGO goes bankrupt or not! just want to wait and see :-? Just curious about this post:-? …apa ini semua orisinil hasil pemikiran mas Pri sendiri atau copy-paste dari berbagai resources? Cuma kebetulan saja pastinya, yang kebetulan juga bisa meningkatkan traffic reader dari dalam dan luar negri :-? sama dengan #2, gue gak tahu soal ginian. #30: dan banyak banget dapet spam soal ini, terutama spam komentar di blog ini. mas pri, keep the good posts! Saya ndesit, kadung jadi true believer dari Priyadi. dulu sempet nulis ttg ini di blog saya lama2 stlh dilihat2 lagi.. kayaknya malah bikin tambah males ngelihat agloco (apalagi tuh ada versi indo-nya)..
gak ada konten, gak ada aplikasi yg menarik, isinya cuma jualan referral.. berharap dapet duit.. Skema bisnis yg gak masuk di akal..
SEtahu saya belum ada yang dapat chek dari Agloco. ViewBarnya saja baru bisa didownload. Belum ada pengumuman jelas kapan chek akan mulai dikirim. Kalau SCAM kayaknya tidak. Tapi memang ada member yang tetap ngotot SPAM untuk promosi. Pendiri Agloco merupakan founder AllAdvantage.com dulu. Wekekkee. New program at new era. Anything could possibly make money. It’s just should happen at the right time and placement. Semua artikel disini sungguh TIDAK BERMUTU! Isinya hanya menjelekkan orang lain. Kamu adalah masalah bagi Cyber World, Priyadi KEPARAT! Ih, yang di atas kenapa ya??? :-? @49: >:/ Bapak Priyadi memberikan info yang relatif berguna. Iri hati dan dengki tidak diperkenankan. Sape tau bisa kaya mendadak gara-gara ikutan agloco. Sambil surfing pasang viewbar, gak ada salahnya dunk….:-? Ya XMAN, ente emangnya sudah mencoba itu Agloco? Hare gene masih nyoba paid-to-surf? * Using a pyramid-like concept, a large number of members will be recruited; Agloco envisages between 1 and 10 million members. Recruitment bonuses are not paid in cash, but in â€œunitsâ€/â€sharesâ€ with vague promises of large profits some unspecified time in the future. * The members surf advertisements on the internet and generate a small income per surfing hour to the company (which becomes quite much money if there are several million members), but the members are not paid any money; They only receive â€œunitsâ€, with vague promises of large profits on these â€œsharesâ€ sometime in the future, â€œwhen the company becomes profitableâ€. * In the end, the members will be left with a heap of worthless shares in a bankrupt or shut down Agloco, as â€œcompensationâ€ for their advertisement surfing and recruitment efforts (but with no money). The owners/management, on the other hand, will have enjoyed being paid high salaries and commissions for a couple of years, and can retire from Agloco as wealthy men. Get a large number of people to work for you without being paid, by promising them large profits in the future. Then pocket the revenue from their efforts yourself! ya saya sih sudah Join….Member sudah mencapai 678 member sampai saat ini, Jumlah hours sudah sekitar 123 hours, tapi Check emang belum nerima sih….Tidak terlalu berharap tapi tidak ada salahnya ikutan..(kalu REJEKI kan nggak kemana…hehehheheh (Ngomong2 Mas PRIYADI dah ikutan Daftar belum ya??? Ini “NYEPAM” apa nggak ya?? ?